The late Queen Anne of Romania was born on this day in 1923, exactly 95 years ago! The Bourbon-Parma Princess became the last Queen of Romania, and spent the majority of her life in exile. Not known for wearing a lot of grand jewels, we have already covered her appearances in the Romanian Greek Key Tiara, and today we are taking a look at one of her lesser-known pieces, her Sapphire Demi-Parure. Queen Anne inherited the Sapphire Demi-Parure, which includes a necklace, earrings, and a brooch, from one of her Danish Aunts, possibly Princess Viggo, and wore the piece at quite a few events, including the Wedding Ball of Princess Caroline and Philippe Junot (with a mystery Tiara), the 50th Birthday of King Constantine of Greece, and Queen Margrethe and Prince Henrik’s 25th Wedding Anniversary. 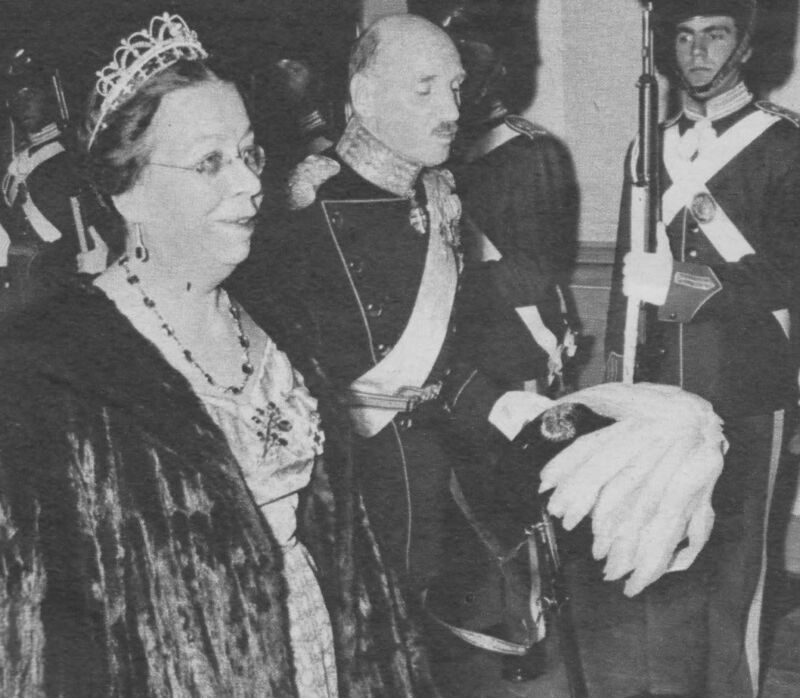 Queen Anne also loaned the necklace to her eldest daughter, Crown Princess Margretha, for a Gala in the 1980s. After Queen Anne’s passing in 2016, the Sapphire Demi-Parure was inherited by Crown Princess Margretha, who has worn it quite a few times recently, including a reception for King Michael’s 95th Birthday and a formal Diplomatic Reception. There is no doubt the piece will be worn for years to come, maybe even at the upcoming wedding of former Prince Nicholas of Romania in a few days. This is a very lovely demi-parure, one that seems to flatter everyone who wears it! I don’t know if HM Margarita will wear it to her nephew’s wedding since as I understand it the royal house hasn’t said one way or another. His mother Princess Helen has said she will not attend, so in view of that, maybe the chances of his aunt attending are pretty slim? I don’t know. Hopefully they’ll have a change of heart! It really is lovely! I actually wrote the article before the news came out, but I’m hoping someone wears it soon!